Lasagna is a very personal thing. 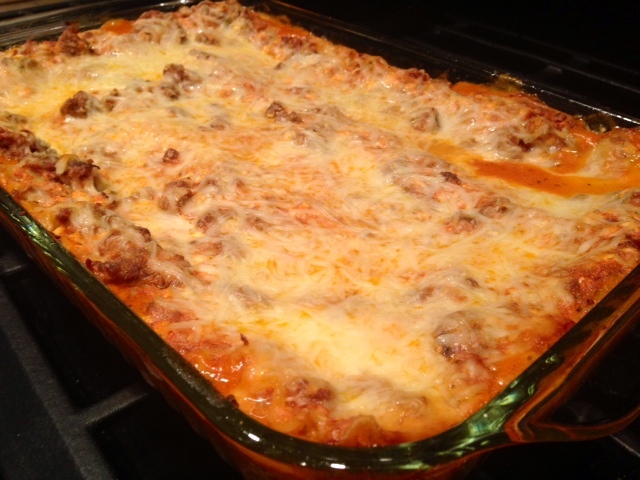 In general, most people think their mom’s/grandma’s/wife’s/pick your relative’s lasagna is the absolute best thing in the world, and all other lasagnas are vastly inferior. I certainly fall into this camp. 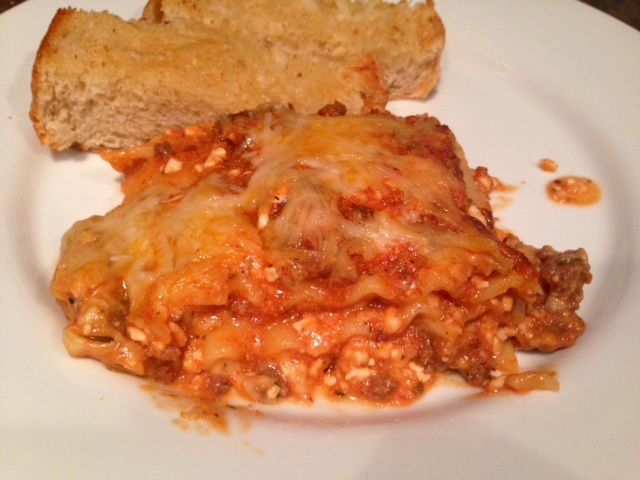 I’m don’t think I even ate any other lasagna except my mom’s until I was…in college? And then I was so disappointed by it that it only reinforced my opinion. 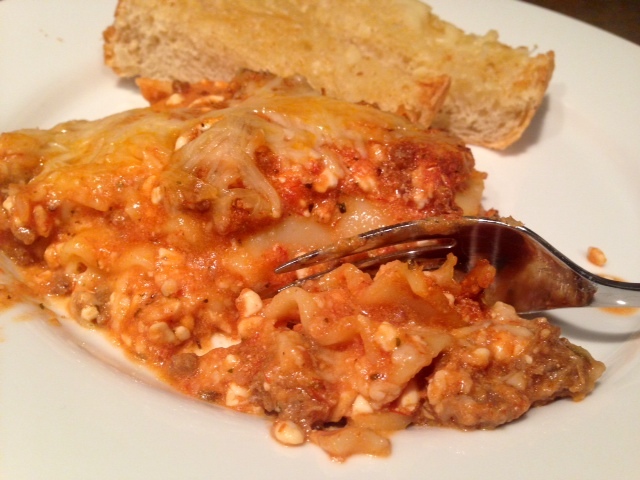 This lasagna recipe is really easy to put together, and it gets its awesomeness from a couple ingredients that are outside the norm. Instead of a homemade marinara or a jarred tomato sauce, it uses a specific Hunt’s canned four-cheese sauce, which gives it a special flavor. And rather than the traditional ricotta, it uses cottage cheese. Yeah, I know it sounds weird. I think we started doing that when I was a kid and I didn’t like ricotta and my mom wasn’t too crazy about it either. But what we discovered is that the little curds in the cottage cheese end up melting and take this to a whole other level of gooeyness (instead of the graininess of ricotta). Preheat the oven to 350 F. Set a large pot of water to boil. 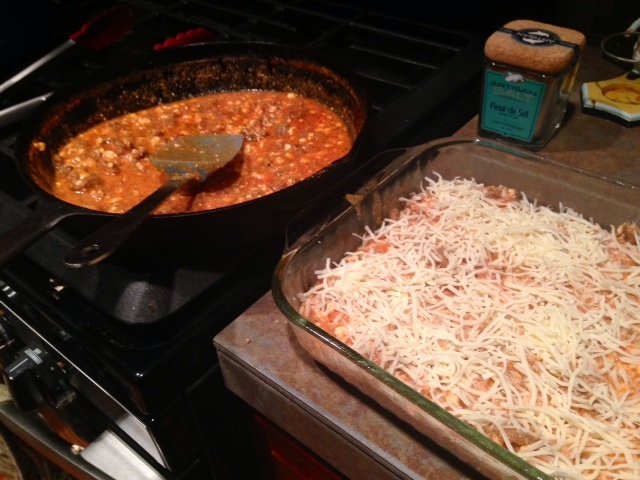 When it boils, add a handful of salt, and nine lasagna noodles. As soon as they start to soften, push them down to where the whole noodle is in the water. 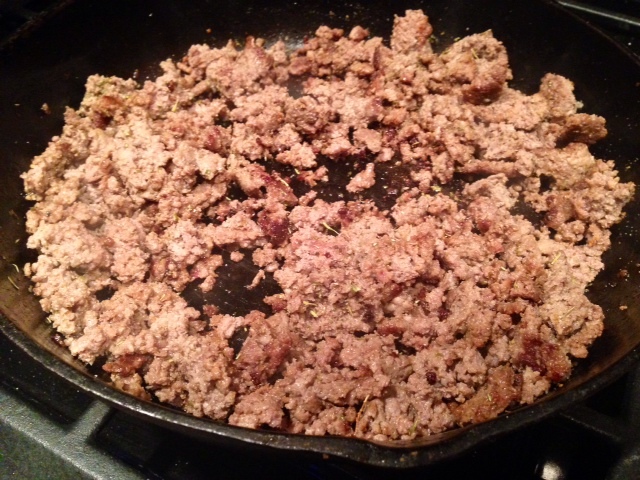 Cook the hamburger in a large pan (I recommend cast iron) and chop it up fine as it’s cooking. When no pink remains, add some salt, pepper, garlic (either powdered or fresh) and a few tablespoons of Italian seasoning. 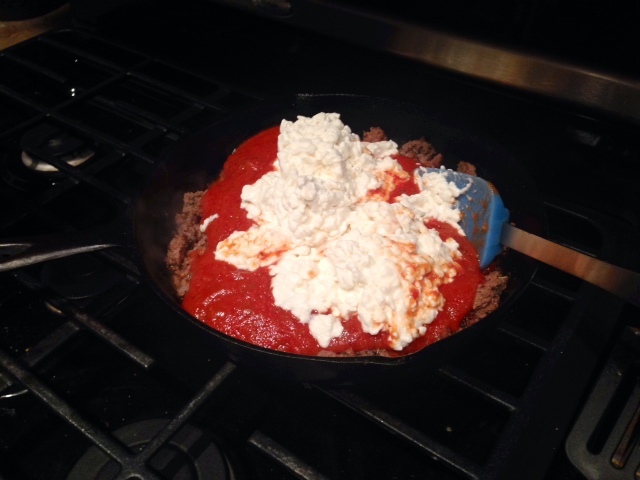 Add the tomato sauce and cottage cheese, and carefully stir everything together. Turn the heat down to medium-low (or low, depending on your stove) and let the mixture simmer and the flavors come together. 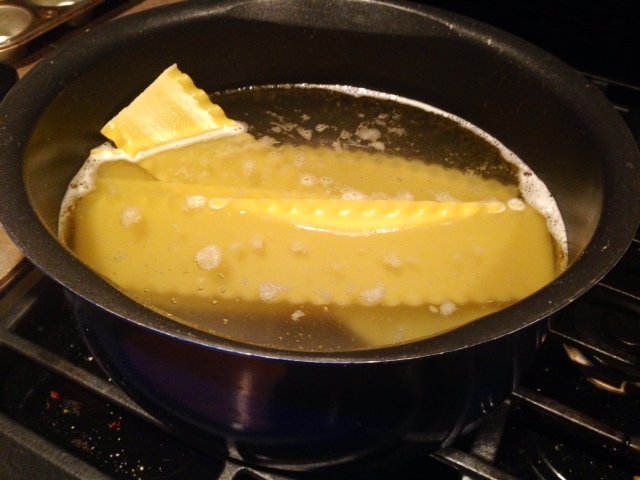 Cook your pasta until it’s al dente (it will keep cooking a little bit in the oven) and turn the heat off. 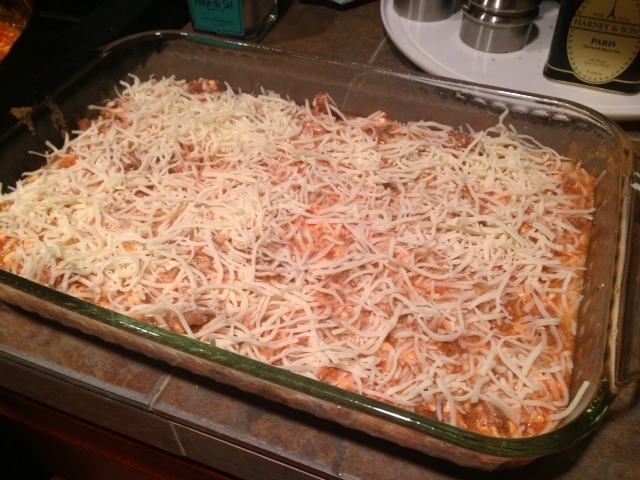 To assemble, prep a 9×13 pan with non-stick spray (just in case) and spread a layer of the filling on the bottom. 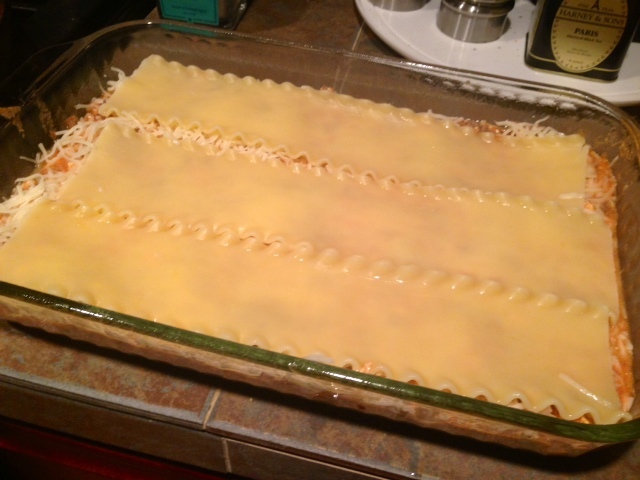 Lay three noodles along the length of the pan, spread more filling over the noodles, and sprinkle with mozzarella. I have silicone-tipped tons that I use to get the slippery noodles out of the water and into the pan. Repeat this process for two more layers. When you’re finished, sprinkle generously with mozzarella, and add a little shredded parmesan for good measure. 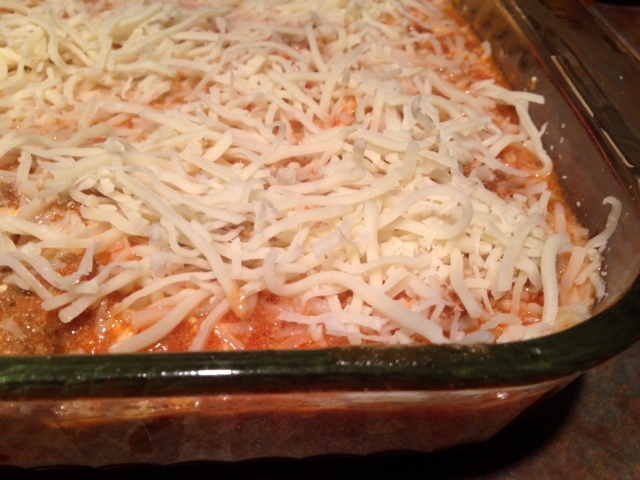 Bake for 25-30 minutes, until it’s bubbling up the sides and the cheese on top is melted and starting to brown. Once you remove it from the oven, let it sit for 15 minutes so it can set up properly (otherwise it’ll be too liquidy). To me, this is best served fresh out of the oven, but the leftovers are amazing as well—some of my family thinks it’s actually better the second day (though I think they’re crazy). Preheat the oven to 350 F. Set a large pot of water to boil. 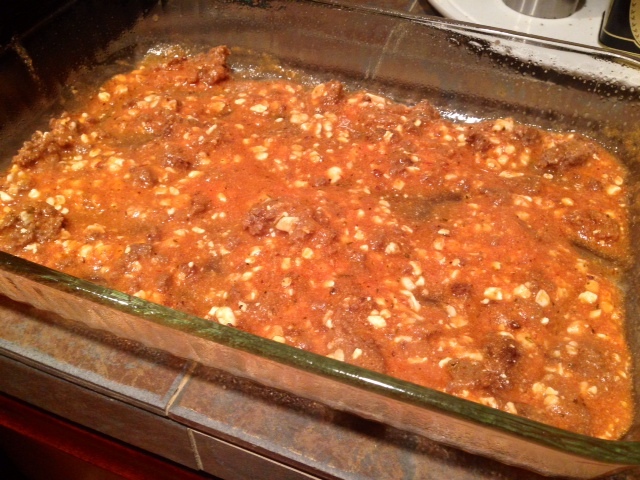 When it boils, add a handful of salt and the lasagna noodles. As soon as they start to soften, push them down to where the whole noodle is in the water. Cook until al dente, then turn off the water. While the water is boiling, cook the hamburger in a large pan—I recommend cast iron. As it cooks, chop it up fine. When no pink remains, season with salt, pepper, garlic (either powdered or fresh) and a few tablespoons of Italian seasoning. 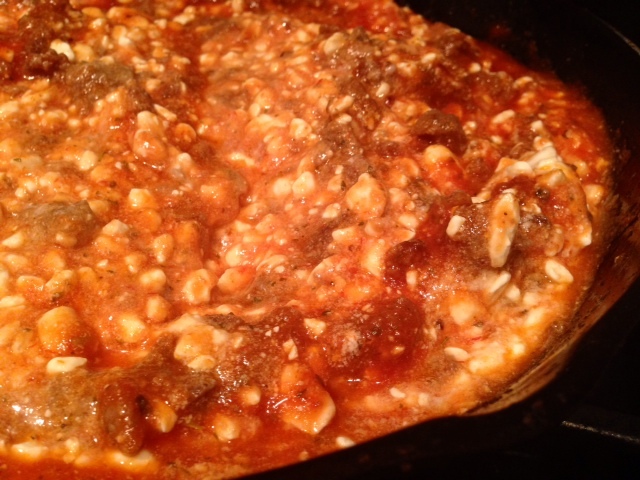 Add the tomato sauce and cottage cheese, and carefully stir everything together. Turn the heat down to medium-low (or low, depending on your stove) and let the mixture simmer and the flavors come together while the pasta is cooking. To assemble, prep a 9×13 pan with non-stick spray (just in case) and spread a layer of the filling on the bottom. 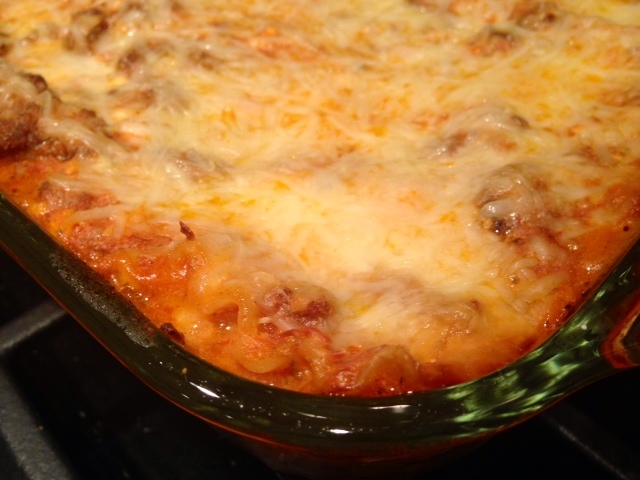 Lay three noodles along the length of the pan, spread more filling over the noodles, and sprinkle with mozzarella. I have silicone-tipped tons that I use to get the slippery noodles out of the water and into the pan. Repeat the process for the other two layers, and then sprinkle the top generously with mozzarella (and a little shredded parmesan if you want to get fancy).